If you have a baking rack to place on a lined baking sheet, this is preferred as the chicken wings release liquid as they bake in the oven. Preheat oven to 400 degrees F. Place your baking rack on a prepared lined baking sheet. Pat your chicken wings dry with paper towels, place in a large bowl and set aside. In a small bowl, combine the melted butter, vegetable oil, garlic powder, and salt and pepper. Pour the mixture over the wings and toss well to coat. Place the wings on the baking rack (in the baking sheet) and bake for about 25-30 minutes, flipping the wings halfway through. Melt the butter in a small saucepan over medium heat. Whisk in the flour until lightly browned, for about 1 minute. Stir in the honey, Sriracha, soy sauce and lime juice. Bring to a slight boil and let simmer until slightly thickened, for about 1-2 minutes. Remove from the heat and set aside. 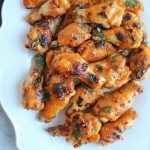 Returning to the wings: After baking, remove the wings from the oven and switch the oven temp to a full broil (500 degrees) and brush the wings with the Sriracha glaze, sprinkle on the red chili pepper flakes, fresh cilantro and sesame seeds and broil for 2-3 minutes, watching your wings carefully to ensure they do not burn. Allow to cool slightly and serve immediately.